EskoWorld 2017, the 26th EskoWorld, was held in Charlotte NC last month. I found it to be a high energy event set apart by the fact that of the more than 500 customers who attended, about 20%, or 100 of them, were brand owners, from 43 companies! This is quite an achievement, and the target for next EskoWorld is to grow that number even more (target is 150). This is quite an achievement, considering that the 2012 EskoWorld held in New Orleans attracted a grand total of two (2) brand owners! Plus, as is usual for these events, there was a robust partner pavilion, called the Interaction Room; interesting keynotes; and plenty of opportunity for networking. Esko executives were highly visible throughout the event, and they were also joined by other Danaher executives. 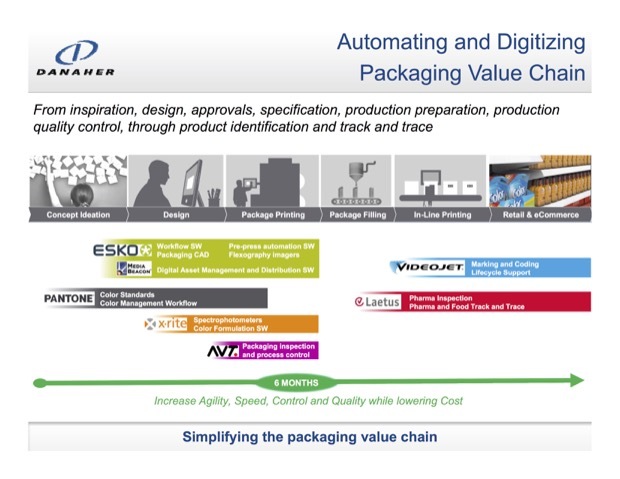 As we saw in the Esko briefing I attended in Belgium earlier this year, the Danaher group of companies in its Product Identification Platform have gotten much better at articulating how they all work together across the packaging supply chain, and it is quite an impressive array of capabilities. The new Esko Platform for Brands is fully integrated with the Media Beacon digital asset management system, a company that Esko acquired two years ago. WebCenter and Media Beacon now have the same user interface, enabling brands to more effectively manage digital assets in the packaging creation process. On the roadmap is the integration of Pantone palettes into Media Beacon, including previews of how the colors will appear on specific substrates. Automation Engine, for converters and premedia operations, now has a browser-based interface. Esko is also offering a preconfigured label workflow that helps label converters get up to speed faster in implementing new workflows. He points out that not only does this speed the design process, but these images can also be used for ecommerce and minimize the need for expensive product photo shoots. I sat through several of the presentations in the Brands track, and saw a very positive response from attendees to these announcements. During the sessions, there was a great deal of discussion about the need to more frequently change packaging and cost-efficiently produce packaging in smaller lot sizes. Esko pointed out that 10% of brands drive 70% of packaging changes, suggesting that perhaps smaller businesses cannot do the changes as fast as they would like. And there are both benefits of and requirements for these changes. In terms of benefits, one interesting case study that was cited was Lean Cuisine. In a category that is declining at 3%, Lean Cuisine credits its renovated packaging with 7% growth. Another example was Amarula, a cream liquor from South Africa that is made from the fruit of the African marula tree. Because elephants enjoy eating that fruit, and because there are only about 400,000 African elephants remaining, the company co-funded with the Amarula Elephant Research Programme at the University of Natal, Durban, called Name Them, Save Them. It allows customers to design and name an elephant and share on social media to raise awareness of the plight of African elephants Now the named elephants are being brought to life on the labels of 400,000 individual Amarula bottles – one for each of the remaining African elephants. 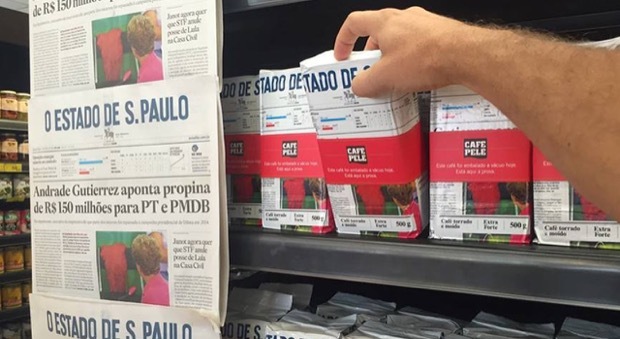 Finally, and maybe most impressively, Cafe Pele in Brazil teamed up with a daily newspaper to show how quickly its fresh products arrive in supermarkets. 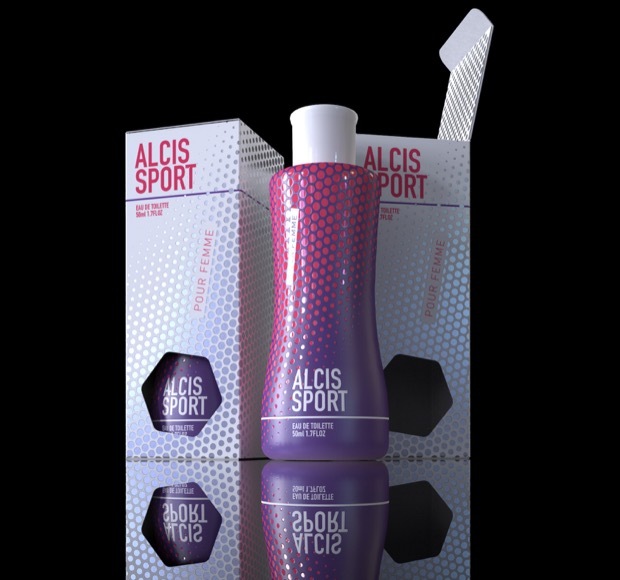 The packaging features an image of that day’s newspaper. These are examples of how demands on the packaging supply chain for faster response and smaller lot sizes are escalating, requiring more automation across the entire supply chain. The other big challenge facing the packaging supply chain are the changes in food labeling regulations being imposed by the U.S. FDA. This will require major changes across the board in food packaging. 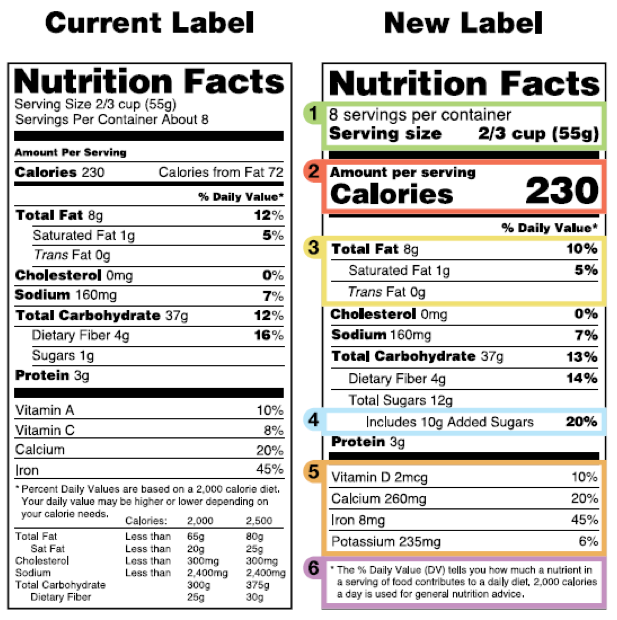 According to the FDA, manufacturers will need to use the new label by July 26, 2018. However, manufacturers with less than $10 million in annual food sales will have an additional year to comply. 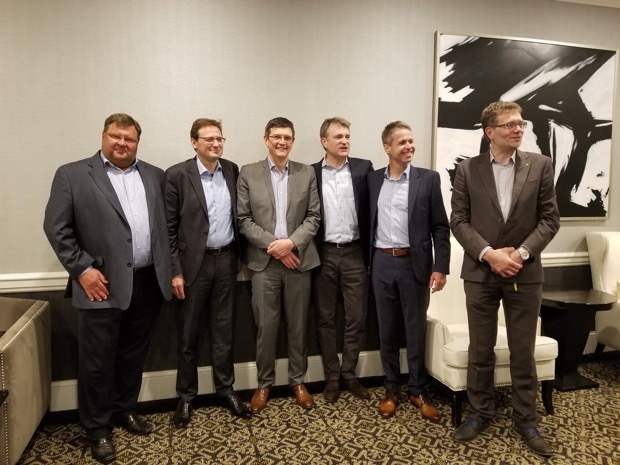 Esko has developed a means of automating the process of replacing the labeling in packaging using WebCenter, eliminating the manual cut-and-paste approach that would have been otherwise required, and there was a great deal of discussion about this at the event. This is one way Esko is turning its theme of “Packaging Simplified.” into reality. I also appreciated Esko’s unique product roadmap presentation on the main stage. While there were individual deep dive sessions on product roadmaps, this overview was truly a best practice. Each product manager had one minute and one slide to present his or her roadmap in a fun and entertaining manner and they were very creative! We’ve all been through the hour-long slide by slide, feature by feature roadmap presentations, and they can be grueling, for the presenters as well as the audience. This approach allows people to get the high level overview of what is happening, helping them decide which deep dive sessions will be most valuable to them. It also gives great visibility to these hard-working product managers. I also wanted to give a big shout-out to Dr. Alan Beaulieu, the President of ITR Economics. His presentation was lively and entertaining, as well as informative, which you can’t always say about presentations by economists! He claims to have been able to project economic growth with an accuracy in the high 90s over the last 15 years. If you want to know what’s ahead, here’s what he had to say: Positive growth over the next 12 months with the rate of growth cooling off in the second half of 2018. He expects to see a mild consumer-led recession in the U.S. in 2019. Although he spoke a bit about the rise in protectionism, saying that it plays well with the population, but not with the economy, adding, “If indeed we develop a protectionist environment, 2019 will become a medium recession or worse.” He also opined that driving down immigration will have a negative impact on the economy. His message to brands: Chase the optimistic consumer while you can and change your messaging accordingly in 2019. Another reason for flexibility in packaging changes! He does expect the 2020’s to be good, in fact calling them the Roaring 20’s and a fantastic retirement environment. So we can look forward to that. There was much more covered at the event, but these were the key highlights for me. I am looking forward to attending again next year!